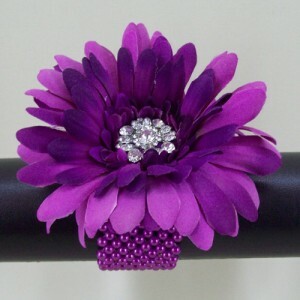 Amethyst silk gerbera wrist corsage on an amethyst bead bracelet. Finished with diamante flower centre this elasticated wrist Corsage will finish your outfit to perfection with it's luxurious, classic styling and extremely easy to wear. A silk flower and crystal wrist corsage is the perfect accessory for weddings, prom nights, race days, graduation balls and formal occasions. No problems with wilting flowers and falling petals with silk flower corsages plus you will a keepsake memento of your special day! Check out our new collection of silk hair flowers to complete your look.